LIMITED TIME OFFER! The Best Deal You´ve Been Waiting for! 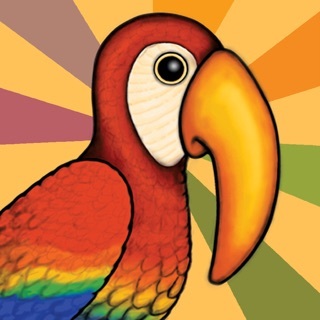 SAVE 70% DISCOUNT in ALL PACKS with up to +8000 new species! 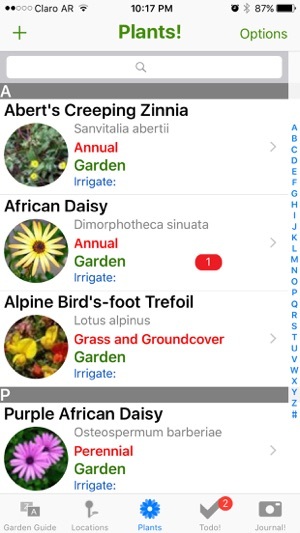 Enhanced and redesigned to works in both iPhone & iPad, with new features to make the app more helpful to gardener users! Garden Pro! 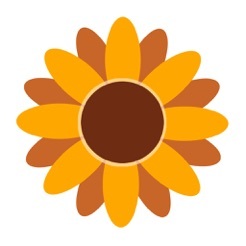 provide all the information you need about thousands flowers and plants, fast and easy, in your hand, everywhere. Up to +12.000 plants descriptions, including... common and botanical names, light, water, soil and climate requirements, planting and blooming times, most important care to do and more about flowers and plants you love and enjoy! Manage and organize all your own plants. 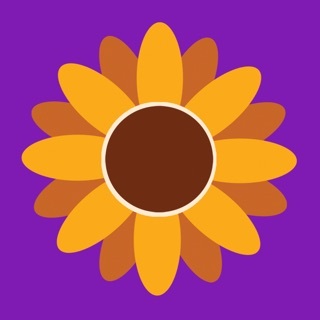 Keep all tasks to do updated with notifications, manage many locations, take journal snapshots in The Most Complete Gardening App! Include a comprehensive Guide about Pests and Diseases. 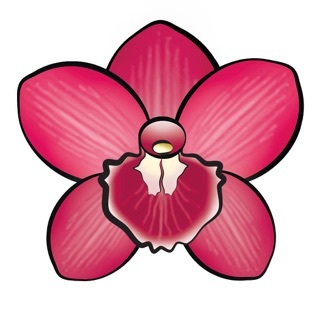 • An easy and fast reference +12000 plants with beautiful images. 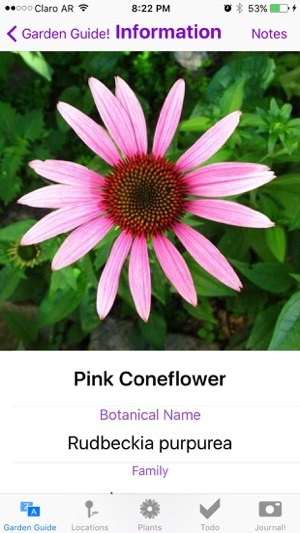 • Search by Common Name, Botanical Name, Family, Category, Hardiness zones, Light, Soil, Water and Climate Requirements, Care to do, and more. • Garden Pro! now is Universal, designed for the iPhone and iPad! 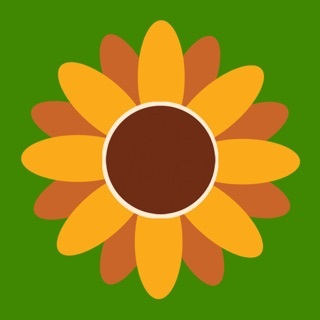 We are continuously working to improve Garden Pro! with new features soon. This app is great so far! Being able to look up plants and set watering notifications is great. My only suggestion would be add to every single plant known to man. Lol I have Dwarf Cavendish Banana Tree and it's not listed. Neither are certain lily species that are common to the mid-Atlantic area. Good. . . chance to be great if . . . 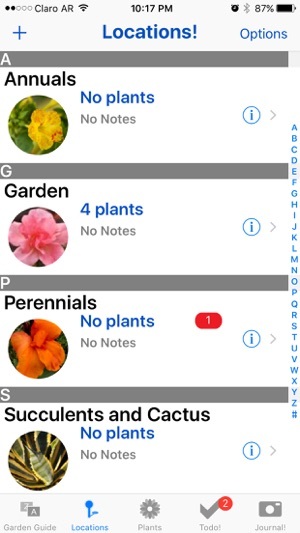 I downloaded this app today in the hopes of replacing the excel spreadsheet I use to keep track of the plants in my garden and manage annual tasks for each. Organization of beds/locations and plants is good. I have invested time in taking pictures of the 23 locations in my garden and have begun painstakingly adding each plant with its associated information. THE MAJOR IMPROVEMENT I would recommend to this developer is adding a repeat function to the plant todo lists. It would be great to add a plant and then a maintenance todo that reoccurs every year/ month/ day etc. Eg. Knockout roses: every March prune and fertilize; every April clean up broken, crowded, dead branches; every June fertilize; every October fertilize and prune. 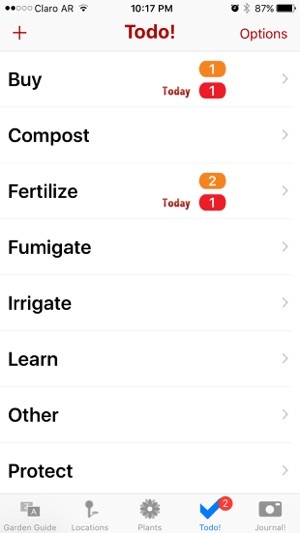 Then on the date (March 1) of any given year user receives a reminder for all plants that have been tagged for fertilizing, pruning, dividing, etc. Right now I am a little hesitant to continue my data input as I need this function in order to use the app. As is, this app organizes wonderfully— but so does my excel spreadsheet. I am looking for organization AND reminders. Please let me know if you add this function and I will carry on with my painstaking data input. I like the application, but even though I am a very poor speller, the misspellings grammar errors in this app are glaring even to me. You need to hire a doc-writer/editor to proofread all the text. For example, Cares should be Care (no S), and Requeriments should be Requirements, and "Every soil" should be "Any soil type" or "All soil types except clay". You also need to add zone information. I need to be able to search for plants that grow well in Texas, while someone from New York needs to see a totally different plant list. 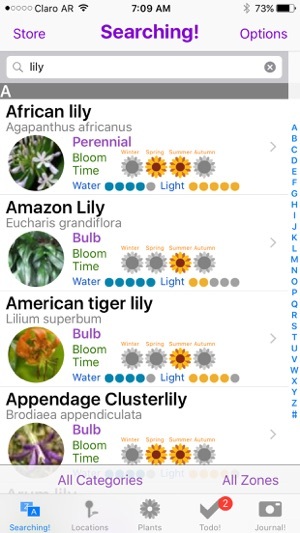 I would also like to suggest that a great enhancement would be to add an "ID ThisPlant" function where I could snap a picture of a plant that would be sent to a server where other users of the application could browse and identify the plant (or disease). This would make the application much more useful to me. Finally, the links to your support site on the App Store description appear to be broken. © 2018 ® Nature Things!